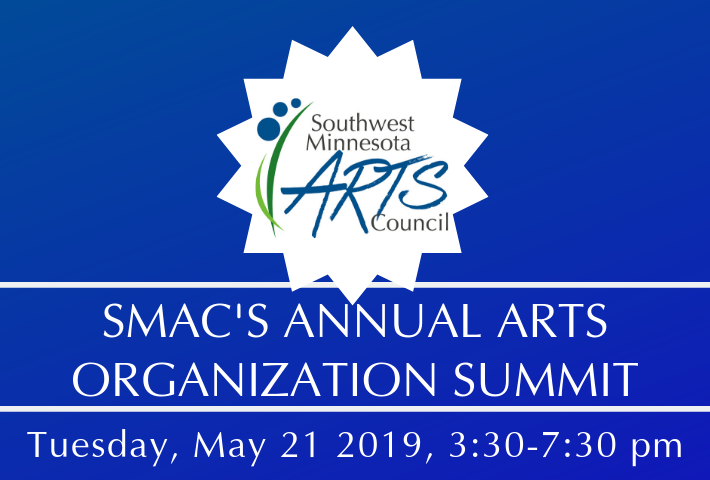 This is SMAC’s annual FREE learning opportunity provided to arts organizations in the Southwest Minnesota region and we sincerely hope to see you and/or your arts organization represented. Join arts organizations of all types — theater, music, visual, arts councils and more — for an afternoon of learning & networking. “Serving the Underserved”: What does that mean for your rural arts organization? We will be learning to address DEI through the Cultural Community Benefits Principles (CCBP) Toolkit developed by ArtChangeUS. The goal of the principles is to offer a values-driven and pragmatic approach to building equitable relationships by shifting our institutional practices. Every organization operates in its own context; the lessons, practices, and information contained in this toolkit should be used to spur reflection, conversation and creative thinking around DEI. THANK YOU for your support and encouragement of the arts in the Southwest Minnesota region!